A country of contrasts and diversity like the unexplored landscapes, great biodiversity, fascinating cultures with rich history and wonderful people full of energy and passion, who welcome tourists with open arms. Colombia is the fourth largest country in South America, with an area of 1,130,000 km2 and is the only South American country that borders both the Atlantic and Pacific oceans (It has 2,900 km of coast line). Colombia has 10% of the world’s biodiversity and it is the second country with the greatest biodiversity per square kilometre. More than half of the world’s flower species and the majority of orchid species can be found in Colombia. It is also the third country with the biggest amount of animals species in the world. Its ever-changing geography, its history loaded with mystery and adventure, its people and cultures, have fascinated the world for centuries. Although its excellent coffee and the purity of its emeralds have made the country famous, Colombia is also the homeland of "La leyenda el Dorado" (the Golden legend) and the magical universe of Garcia Marquez’s Macondo. We invite you to travel to Colombia, experience unforgettable moments and fall in love with this magical country. Daily departures with a minimum 2 clients on a request basis. Welcome reception at the airport and transfer to Holiday inn Express Hotel (approx. 40 to 60 minutes, depending on traffic). On the way to the hotel, your guide, will give you all the tips and recommendations you need to get the most of your stay in Colombia. Free evening to explore Bogota or acclimatise and relax after the flight. After breakfast, get ready for a half-day walking tour of Bogota, explore some of the main sights in La Candelaria, the historic centre, including the world famous Museo del Oro (Museum of Gold) and Plaza de Bolivar. Free afternoon. You´ll be picked up for a transfer to Villa de Leyva. On the way you will stop in Zipaquirá where you will see the famous Salt Cathedral built 180 meters underground in a salt mine that was first developed in colonial times. Upon arrival in Villa de Leyva take in the sprawling main square, colonial-style whitewashed architecture and cobbled streets. This is a portrait of rural towns as they once were. There will be time to wander the streets, browse local tiendas, chat it up with locals. Villa de Leyva boasts numerous archaeological and paleontological treasures, and this morning after breakfast, you’ll be taken a private tour exploring the desert landscapes around the town, you can chose if you want to take it by bike, horseback riding or car. You’ll visit an astronomical site and a museum showcasing various fossils. You’ll also visit Casa Terracota, known as the largest ceramics workshop in the world, where you’ll discover the unique forms, colours and textures of the local products. In the afternoon, after time for lunch (not included), discover Villa de Leyva on your own. Take in the sprawling main square, colonial-style whitewashed architecture and cobbled streets. This is a portrait of rural towns as they once were. There will be time to wander the streets, browse local tiendas and chat it up with locals. Or go on a cycling rout with one of our guides. Free evening back to your accommodation. You´ll be picked up for a transfer to Barichara. Upon arrival you´ll get checked in at the Hotel Hicasua. In the evening you´ll be picked up to enjoy a night tour in Barichara. Barichara is one of Colombia's prettiest towns, renowned for its colonial architecture and an oasis of tranquility. The most distinctive features include the cobblestone streets, the rammed-earth houses, the bahareque building style, mud tiles and stone monuments made by well-known Barichara’s artists and visiting artisan workshops and handcraft stores. There're various boutique shops, art galleries and stone carving shops to explore. After breakfast, you’ll set out on a guided walk along a historic cobblestone path, one of the most important trade routes during the colonial period. This route is part of a network of cobblestone paths, called Royal Paths, which link Bogota with the Caribbean coast. At the end of the hike you will arrive in Guane, a little village with a rich archaeological history. 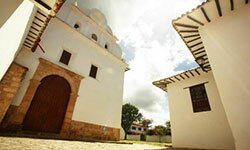 When you arrive in Guane visit the archaeological museum, and the church, enjoy the tranquillity of the place. Free afternoon. Today you´ll be transferred to Bucaramanga to take your flight to Armenia. Upon arrival in Armenia you´ll be transferred to the Hotel Hacienda Combia. In the morning visit the Cocora Valley the birthplace of the wax palm, the national tree of Colombia. Enjoy a hiking to the Niebla Forest and witness an indigenous ritual held at the world's tallest palm tree. Then visit Salento, a traditional coffee town with multicolored houses and artists working in the streets. After you take your lunch visit one of the Café Fincas in the region, a place of cultivation, selection and production of one of the most exclusive Café in the area. Tour of plantation (germinator, nursery and coffee plants) and coffee process (threshing, roasting and physical analysis of coffee). Coffee taste at then end of the tour. Back to the hotel at the end of the afternoon and free evening. You´ll be picked up for a transfer to Armenia´s airport to take your flight to Cartagena, after arrival in Cartagena you will be transferred to Holiday Inn Express in Boca Grande sector (10 min from Old City). Free evening. Visit Cartagena, Colombia’s walled city. Within its fortifications you will find a unique culture and history that seem to blend reality and fantasy. Stroll the cobblestone streets and admire the colonial buildings. Visit the city’s plazas, galleries, churches and vaulted walkways where crafts and antiquities are sold. Visit the Castillo de San Felipe de Barajas, a UNESCO World Heritage Site built during the colonial era to protect Spanish interests from invasions by the English and French. Explore Cerro de la Popa, where you will find a church and colonial convent constructed in the 17th century. Free afternoon. Expend the day and night in Rosario Islands. After breakfast, pick up at 08h05 to travel to Hotel San Pedro de Majagua, a charming coral archipelago located only 50 minutes by shared speedboat. Upon your arrival, free time for you to explore this beautiful place and enjoy the beaches of the National Natural Park of Corales. Several nautical activities available upon arrival. Around 4 pm you will take a shared boat transfer back to Cartagena. Free evening. Transfer out to CTG airport for your flight back home. - Guided excursion with local guides. - Meals as mentioned in the itinerry or quote(B: breakfast, L: lunch, D: dinner). - Accommodation at the mentioned hotels. DBL basis. - Contribution to reforestation project (12 trees per person) (optional - you can deduct it). - Domestic flights (upon request). - Tips, gratuities, personal purchases.